Knowing the difference between a legit and scam bitcoin mining platforms have always been an issue for online users. On many occasions, internet users and bitcoin enthusiasts have lost good number of bitcoins to fraud website. So in this article we’ll take a look at some few reasons why you should consider using CryptoTab to mine bitcoin. The very first important feature of every mining sites or Application is that no mining of bitcoin can be done offline. And CryptoTab passed this test in that it doesn’t mine it’s bitcoin offline but shows you an error message when the internet is turned off. See the two images below to confirm. From the above, in picture1 the PC was disconnected from the internet and it showed an error message. 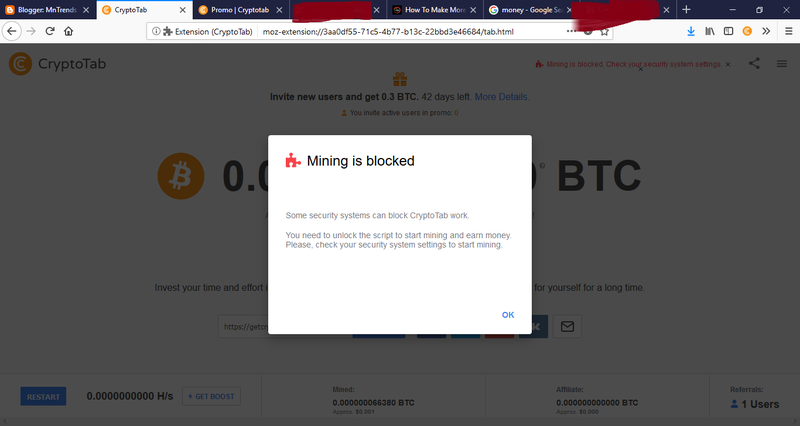 This is typical of every legit bitcoin mining platforms as mining needs network to connect to the mining pool. Next picture was when it was connected to the internet and lastly the picture where a user decides to turn off the mining completely. Another reason why you should consider using cryptotab is that its free. Actually you only need data, an electronic device and just one tab of your browser to try it out. If you don’t like it just shove it aside and disable the Add-ons from your browser and it’s done and gone. So it won’t actually hurt and come to think of it, its a win-win situation for you. Lastly, in CryptoTab website it is clearly stated among the FAQ that mining a withdrawal-able amount of bitcoin might take months. 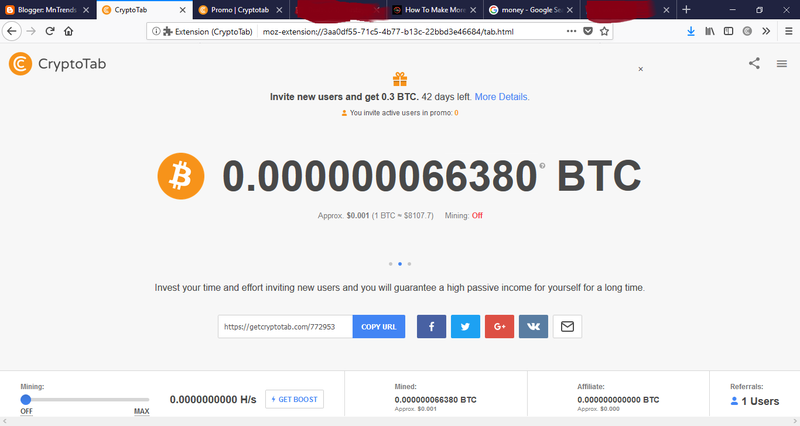 This is so unlike other scam mining platforms that offers you mouth watering offers bitcoin within hours. 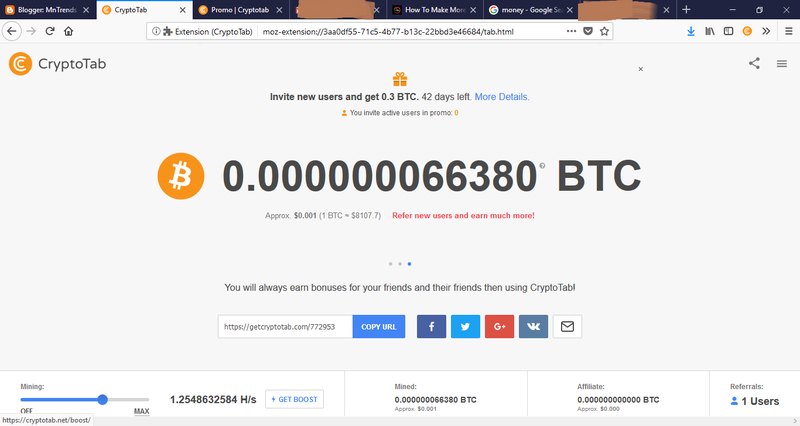 So you can give CryptoTab mining a try by CLICKING HERE and creating a free account with them. Note that using CryptoTab is on trial for Mntrends and if we can confirm a withdrawal we’ll sure let our readers know about it. But till then you can register and start mining your own bitcoins. Have any questions, please leave them in the comment section below. 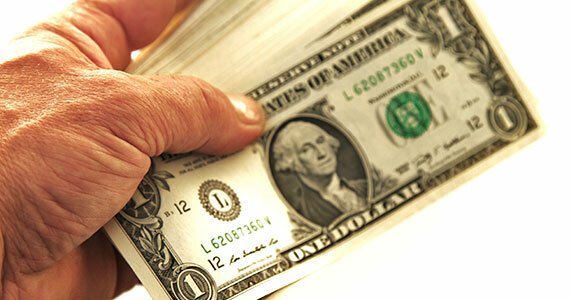 Feel the need to contact us, please use the CONTACT US PAGE to send us a message.